McCall pattern 1254 for a Mexican-influenced embroidered peasant blouse. Circa 1945, illustrated in May 1950 needlework catalog. When full, puffy sleeves returned to fashion in the late 1930’s, the “peasant blouse” reappeared. This Hollywood pattern from the Commercial Pattern Archive for a peasant blouse is from 1938. A “Tyrolean ski suit” available in stores in January, 1936. Woman’s Home Companion, p. 55. “Tyrolean” hats, ski clothes, and embroidery were briefly popular in the late thirties, until WW II tainted anything German or Austrian for U.S. consumers. “The Peasant Note is Popular:” A “Swedish” embroidered headscarf, a “Carnaval” apron (over a peasant style blouse), and a “Tyrolean” knitting bag. Woman’s Home Companion, December 1937. Wool embroidery decorated this Companion-Butterick Triad pattern for schoolgirls. Left, yarn embroidery adds “Peasant” chic to Butterick pattern 7589 for girls 8 to 15. WHC, October 1937. …and “Russian” blouses. A Mexican blouse pattern, McCall 990, at CoPA, dates to 1942. 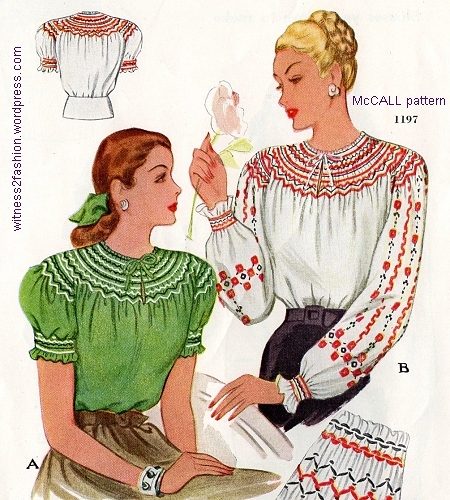 McCall peasant blouse pattern 1385, from a 1950 Needlework catalog, has “heavily Mexican” embroidery. McCall “fiesta-mood” peasant blouse pattern 1317, from about 1947. The illustration is from a 1950 catalog. McCall smocking pattern 1315. Circa 1947. For those who were willing to embroider a blouse, but not to smock it, McCall 1386 offered the option of shirring the blouse and applying very fine rickrack to imitate smocking. McCall 1386, a peasant blouse that could be smocked… or not. Detail of rickrack on McCall Mexican blouse pattern 1386. Circa 1947. We tend to think of 1947 dominated by Dior’s New Look, but comfortable, unstuctured casual clothing was still popular in the pattern books. I went looking for a forties’ photo of my mother in a peasant blouse and found a “twofer:” She’s wearing a peasant blouse and skirt, and I am wearing a smocked dress! American woman in a simple peasant blouse and skirt, with toddler in a smocked dress. Circa 1947. Although this 1950’s pattern for children is not “peasanty,” it can be smocked. In fact, McCall 1402 actually is a smock — a painter’s smock — which reminds us that embroidered smocks were originally worn for work by shepherds and country folks — peasants. A group of country gossips. Punch cartoon from The Way to Wear’em.